Balos - Gramvoussa. 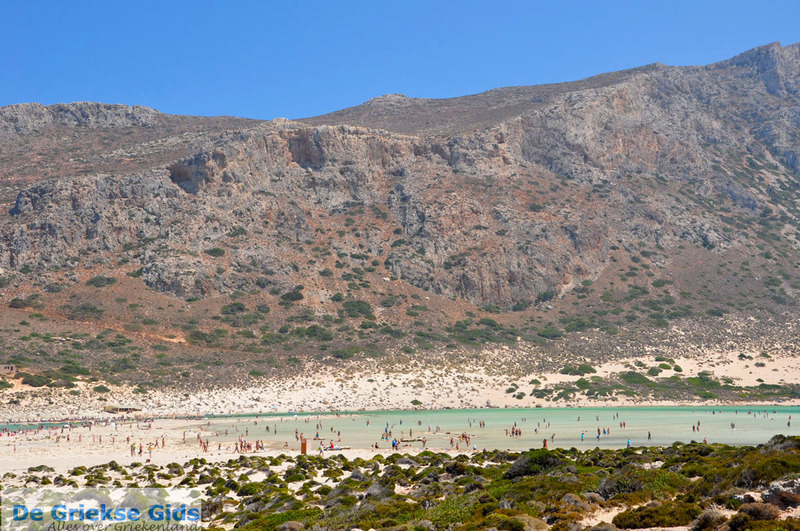 From Rethymnon, we made a trip to the most evocative beach in Crete; Balos Gramvoussa peninsula. 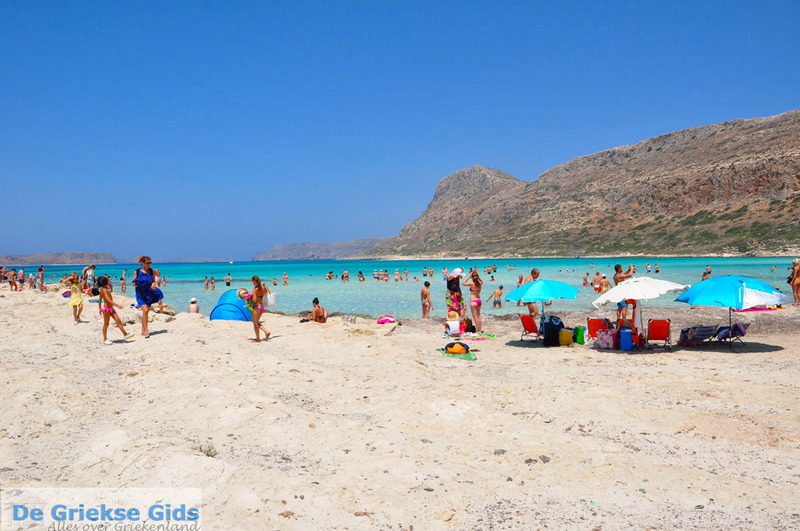 This beautiful beach in Crete is very remote, on the northwest side of the island. Although Balos is indeed accessible by car, the road is unpaved and very bad, it's a dirt road with lots of stones,but leads to this paradise between the mountain and sea. 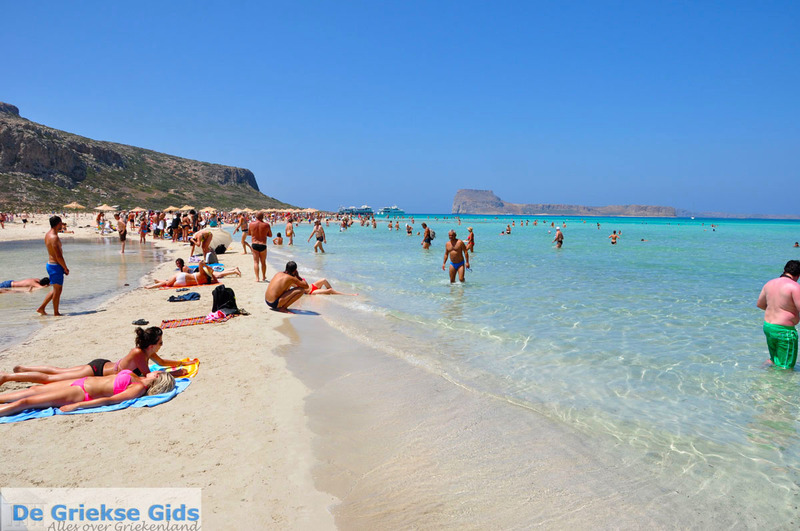 The white sand and turquoise water gives the Balos bay a paradisiacal appearance. We were advised NOT to take this trip with our little rental car, so we chose the option to go by boat. From the harbour west of Kastelli in Kissamos the tourists boat departs. A highlight during this trip for us was experiencing A remarkable phenomenon, because here in the West the land has risen by six to nine meters above sea level. You can see the difference from the colour of the rocks. 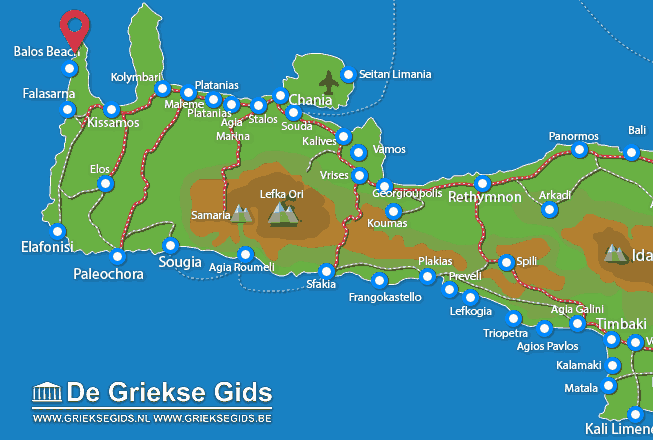 Over a period of 2000 years western Crete has slowly risen from the sea, while the east slowly has settled down. After an hour of sailing, we arrived at the island Imeri Gramvoussa "tame Gramvoussa". 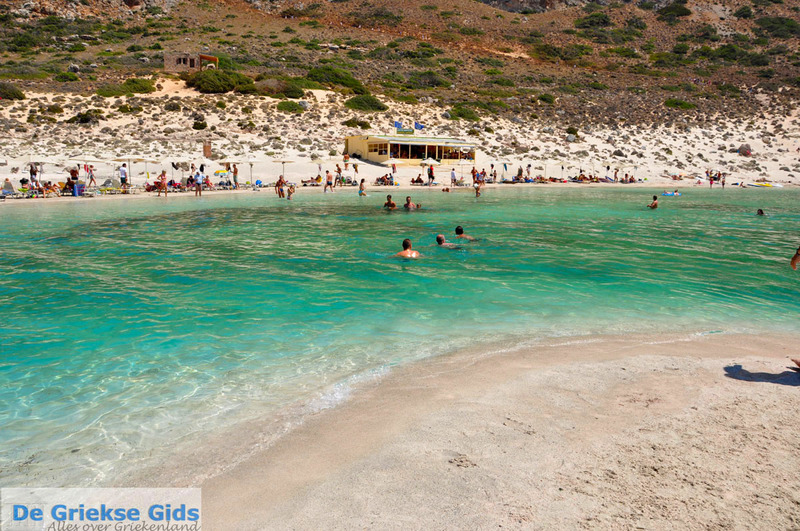 Imeri Gramvoussa is the island that lies just off the coast of the Gramvoussa peninsula. 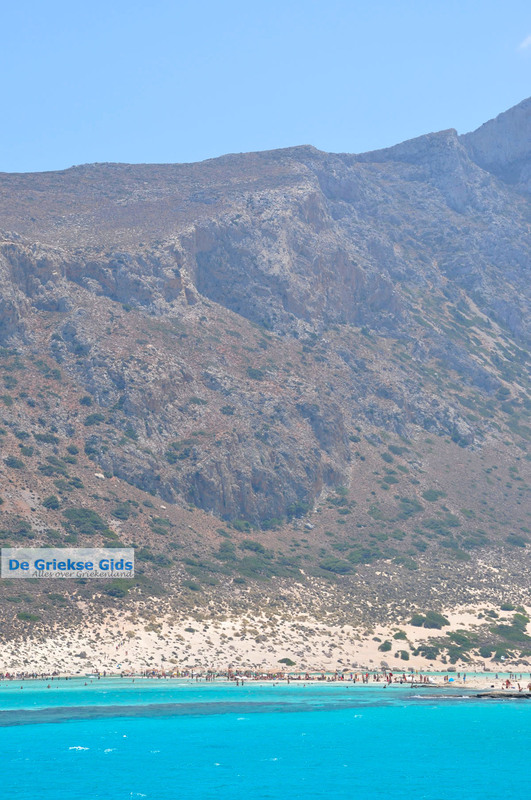 There is another small island nearby called Agria Gramvoussa "wild Gramvoussa". The Venetian castle on Imeri Gramvoussa stands on top of a steep cliff of 137 meters high. After a twenty minute climb facing the bright sun, you arrive at the top. 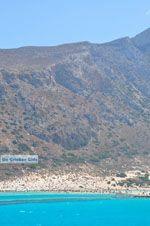 This climb is certainly worth it, because the view from here across Crete and the excellent beach Balos is phenomenal! What beautiful colours and what an amazing experience. Of course visiting the ruins in the castle built in the 16th century is very impressive. The fort was a haven for pirates in the past but also for refugees and revolutionaries during the Turkish occupation of Crete. It is said that pirate treasure is hidden in the caves of the island. Today, the entire area Gramvoussa is an important refuge for birds, there live more than a hundred species of birds. In addition, there are 400 kinds of plants to be found. In the sea caves live the Mediterranean seal and the Caretta-Caretta turtle is also found here. After this our boat left to go to Balos beach. The boat served lunch, that's nice, because we were hungry and we understood that at Balos beach there is nothing for sale, there are no catering facilities available, in fact, there is nothing but the beautiful scenery, beach, mountains and sea. And that's a good thing. The people on the boat are working hard in the kitchen and we opt for a Greek salad, tzatziki and souvlakies. The prices are a little higher than we are used to in Rethymnon, but they are reasonable and not excessive. 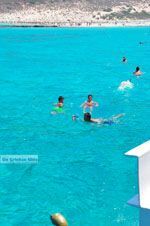 When we arrived in front of the beach the boat stopped and allowed everyone to get off the boat if they chose to "take a dive and swim to the shore, or to go with the small boat that transports the passengers to and from the beach. " We split up because the two eldest sons opted for a dip in the sea, while the youngest together with us sailed to the beach. The lagoon is warm and the sand here feels soft, it is very shallow. On the other hand, in the open sea, you can swim. The bright colors of the water here are intense. We were here in August, the disadvantage being that many tourists have had the same idea and therefore it was very busy at the beach. The advantage of August though, is you can be sure that there will not be a cloud in the sky and the sun will be shining bright, and this is so nice to see in the photos. We would like to visit here again, but then in May or June, so it is much quieter. Our plan is to choose a beautiful, clear day and to leave early, so that there will be hardly any people.There are more than enough sunny days in May and June. I'm already excited! 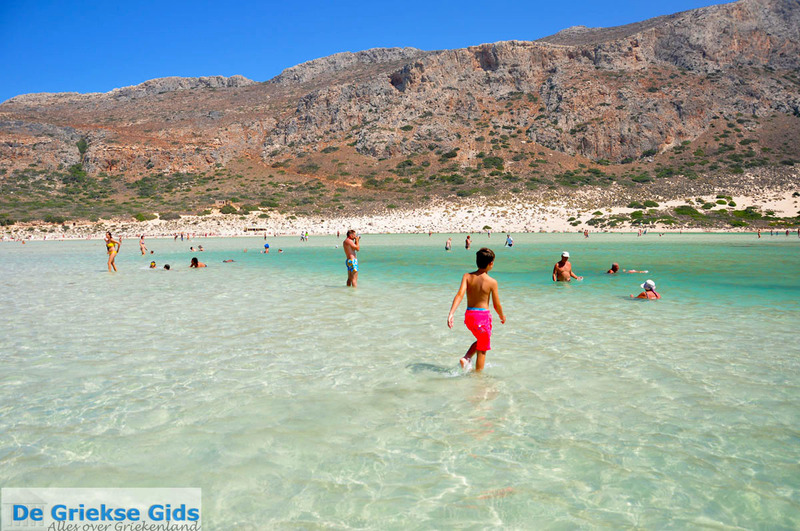 Coincidentally our friends Onno and Danielle together with their children are in Crete during the same period and they have made the trek to Balos by car. Then you are able to leave in your own time and thus avoid the crowds. The disadvantage of this though is that it's still a fairly short walk down. 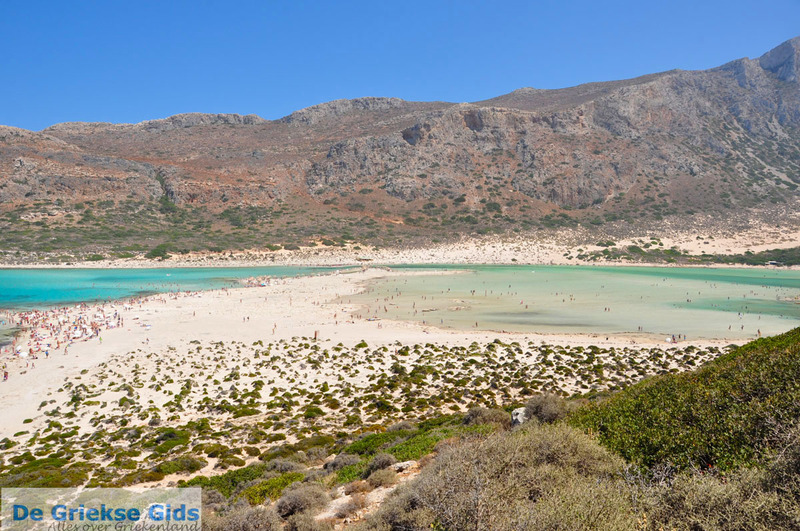 Danielle said: "The trip across the dirt road to Balos took about 45 minutes by car. The walk down to the beach took about 20 minutes. The Walk back took longer of course, especially with children. Along the waythere are donkeys that can help you up as it is quite steep. But it is definitely worth it as the view is so beautiful! Take water with you for the journey upwards. On top of the mountain is a shop where you can buy drinks. Do try to go early in the morning because there is only a small car park and when it is full, you have to park on the side of the narrow road. " If you dare, as many people did, you can go across the dirt road but this is best undertaken with a jeep. If you go by car, you'll be visiting the island Imeri Gramvoussa, with the castle and the beautiful, breathtaking views ... the choice is yours! Or do both. 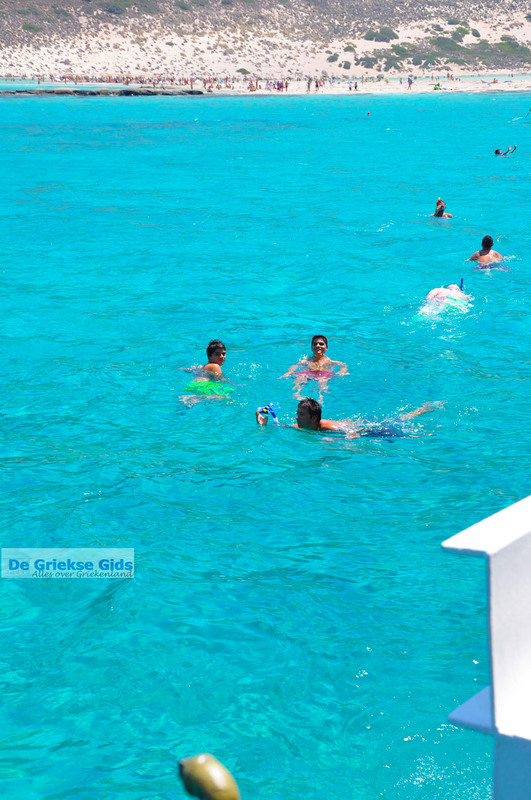 When we arrived right in front of the beach the boat stops and allowed everyone to get off the boat and you can choose your "take a dive and swim to the shore, or going with the small boat that the passengers to and from the beach and boat transports. " We split up because the two eldest sons opt for a dip in the sea, which had the youngest also have wanted, but we take it anyway with us in the boat and sail to the beach. The lagoon is warm and the sand here feels soft, it is very shallow. On the other hand, in the open sea, you can swim. The bright colors of the water here are intense. We have been here in August, the disadvantage is that many tourists had the same idea and therefore it was very busy at the beach. The advantage of August, you sure there is not a cloud in the sky and the sun shining bright, but so nice to see the pictures. We would like to go once around here, but then in May or June, so it is much quieter. Our plan is to choose a beautiful, clear day and to leave early, so there are almost no people. Sunny days are moreover in May and June enough. I'm already excited! 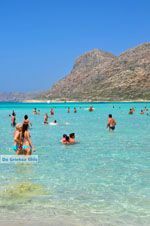 Coincidentally our friends Onno and Danielle with their children in the same period in Crete and they have made the trek to Balos by car. Then you can on your own time, so leave really early and thus the crowds for his. The disadvantage is that it's still a fairly short walk is down. Danielle says: "The trip across the dirt road to Balos took about 45 minutes by car. The walk down to the beach is about 20 minutes. Walk back takes longer of course, especially with children. Along the way donkeys there are donkeys that can help you up as it is quite steep. But it was definitely worth it as the view is unwise beautiful! Take water with you for the journey upward. On top of the mountain is still a shop where you can buy drink. Do try to go early in the morning because there is only a small car park at and when it is full, you have to park on the side of the narrow road. " If you dare, as many people did, you can across the dirt road the best undertake this journey with a jeep. If you go by car, you'll be visiting the island Imeri Gramvoussa, with the castle and the beautiful, breathtaking views ... the choice is yours! Or do both. 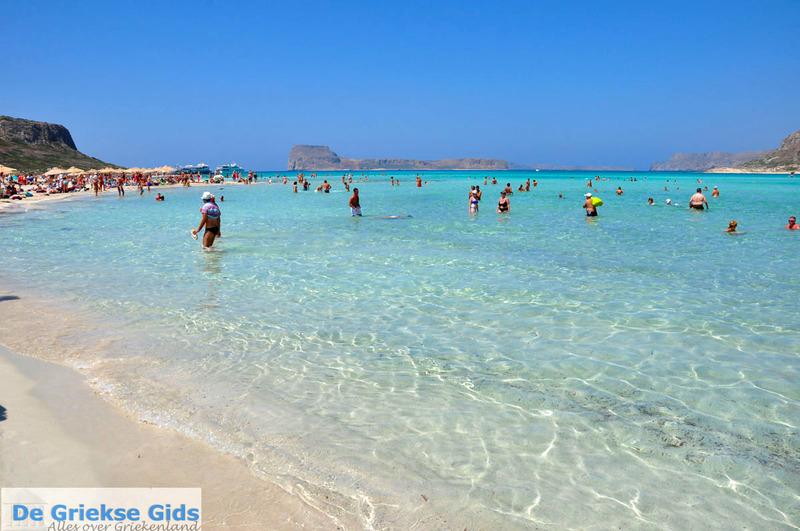 Chania Prefecture: Where on the map is Balos - Gramvoussa located?